Five years later it’s out with the old and in with…Earth 2? 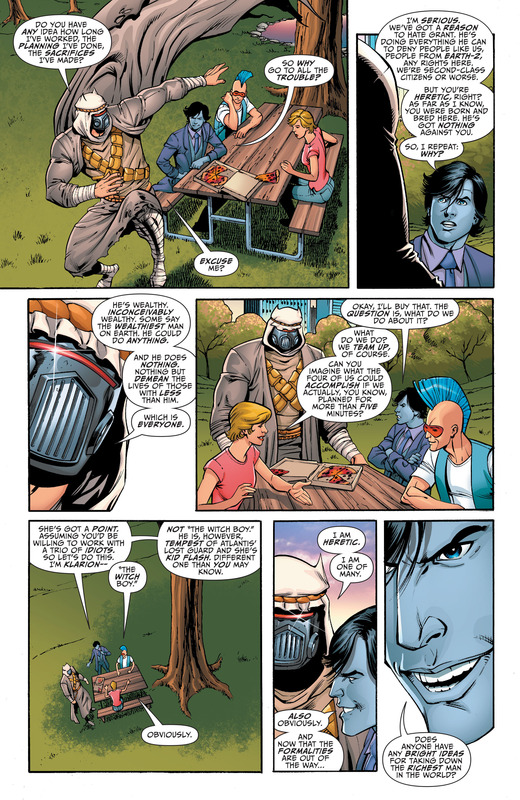 In TEEN TITANS: FUTURE’S END #1, written by Will Pfeifer, pencils by Andy Smith, inks by Keith Champange and Matt Yackey on color, the team we currently (actually love) has been long since disbanded and killed and in their place a gaggle of Earth-2 refugee teenagers have taken up the team moniker. The roster for the Future’s End is mostly made of Earth-2 refugees; Klarion, Tempest, Kid Flash. From Earth Prime Alexia Santos, Animal Girl, and…Heretic? Supposedly one of many (oh Bruce what are you going to do). Klarion is more Zach Zatara than what we’re used to; a bit more human, and while she’s on the cover, there is no Teekl and no hair horns. Tempest is basically Lagoon Boy. 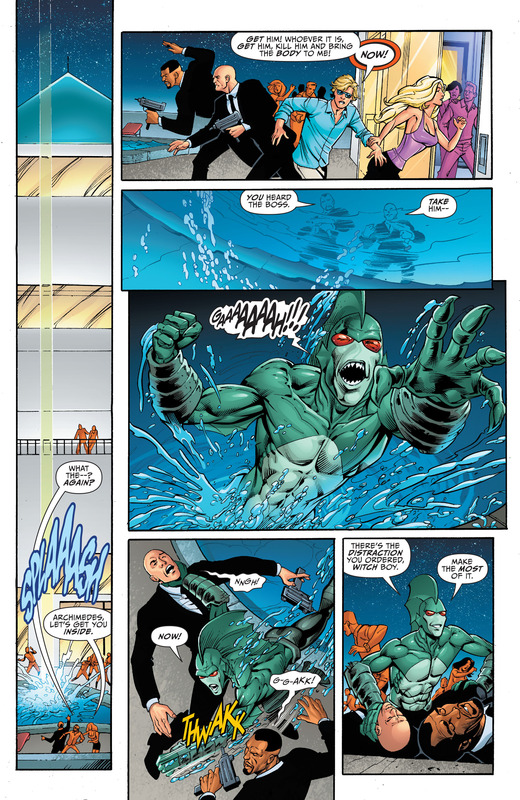 The rag tag group trying to bring down rich party boy Archimedes Grant and Senator Peter Strutz, who has a serious vendetta against Earth-2 “immigrants” is mostly covert; Tempest wanting to free a shark from Archimedes’ home and eventually bring him down. Heretic drops in after they spring the shark, blaming them for making things messy. He ends up helping them, leading a second assault on Archimedes. Achimedes’ girlfriend is revealed to be supervillain cyborg Algorithm who Heretic manages to slice up until Klarion turns her into a flock of butterflies. Meanwhile the waitress from his staff that has escorted him to safety is revealed to be a wild-card vigilante on her own mission; Alexia Santos, a Brazilian girl out for revenge. She’s revealed as Animal Girl, having the powers of Animal Man. Archimedes businesses resulted in her town being destroyed and supposedly wiped out populations of animals, which she took quite personal. They throttle Achimedes and then teleport to DC, where the issue ends with them facing down Senator Strutz. 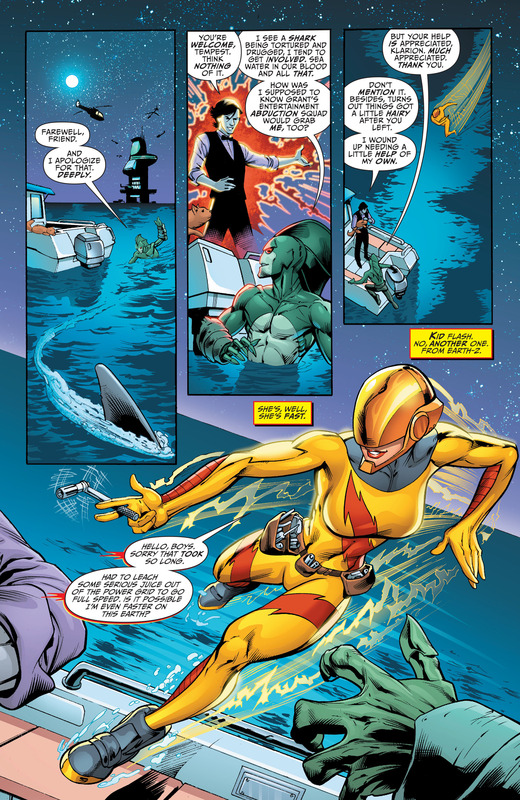 Kid Flash is a girl, which is awesome. This group is strange and while a mini may have given them some clout, I’m not too terribly interested in them since they’re only going to be around for one issue. The writing’s not great here, it’s a bit outdated, not nowhere nearly as outdated as the art we got on this issue. The art is pretty bad. It’s very dated; Tempest gets a “human” illusion form from Klarion and he literally looks like the original Omac. Which could be a nod to him, but it’s so terribly dated looking. The outfits are old. The hair is old. It’s not terribly hip the way the new Batgirl or Gotham Academy looks and it just looks like a throw-away issue. I really wish there was more effort put into these Future’s End issues. They’re not deplorable but they’re not great, either. This is a step down from what we’ve been getting so far in the regular title. Pick it up if you like rag-tag teams. I really don’t see the point of showing off all these characters if they’re not particularly going to be used anytime soon? Why endear us to teams we probably won’t see again for a while if at all? Since this is sort of a “what if” future anyway? And Klarion without a cat? Sacrilege.